You might not pay much attention to your trees, but that can be a bad thing. Take a look at these ten signs you need to get tree removal services. Trees can seem like a rather benign part of nature. They are stately and beautiful, provide shade from the hot sun, and are generally delightful to have around. In fact, without trees, we wouldn’t have the oxygen that we need to breathe as they perform the life-giving function of oxygen production. But trees have a sinister side as well. Did you know that trees are responsible for killing around a hundred people every year? Of course, that’s a pretty low statistic. You shouldn’t lay awake at night worrying about death by tree. It’s probably never going to happen. But you should be aware of the dangers of falling trees and limbs. As a responsible homeowner, you want to make sure that your trees are well maintained and safe. Even if they don’t fall on someone and kill them they can fall on your house, or your neighbor’s house, and cause thousands of dollars in damage. But how do you know when you need tree removal services? Let’s take a look at 10 of the most common signs. Trees near your house are nice to have for the welcome shade they provide in the summer. They help to keep your house cool and the cost of your energy bills down. However, there is one not so pleasant side effect. Trees will constantly leave their debris scattered all over your roof. Whether these are pine needles or simply dead leaves doesn’t matter. It’s unsightly and over time can cause damage to your roof by trapping moisture. When it rains the water can also carry the debris down and fill your gutters. Once enough debris gets stuck in there, it can clog your gutters and prevent them from properly draining rainwater from your roof. Thus, if your roof is full of tree debris it may be time for a haircut for some of your trees. You don’t necessarily have to cut down any trees. Depending on how close they are to your house you may be able to simply have a few of the closest branches removed. Don’t be afraid to talk to a trusted professional to find out your best course of action. Additionally, if you really don’t want to give up your trees or cut any branches you can schedule regular cleaning services. Just be sure to remove any limbs that are in danger of falling on your roof and causing damage. It’s not uncommon for trees to lean. In fact, there are many species of trees where it is unusual to see them completely straight. But you should always keep a close eye on the trees in your yard. Do you notice a tree that didn’t used to lean before now tilting over a bit after a storm? How about a tree that seems to be leaning a little more each day? You have to keep a close eye on these types of leaning trees because the gradual decline can be hard to spot. Regardless, once a tree is leaning more than 15% from straight up and down you should have a professional look at it. Depending on the size of the tree and the size and health of its root system it’s very possible that this tree is becoming unsafe. Another thing to keep an eye on is the overall health of your trees. Sometimes, trees can be big, beautiful and green and yet up in the canopy have large dead branches. Those branches can pose a serious danger. Those dead branches may be a sign that there is something wrong with your tree. But even if your tree is fine and in no danger of falling over those branches can break off and fall. If they are anywhere near your roof they can cause damage to it when they come down. Additionally, if anyone is under them when they fall they can cause serious injury. As your trees grow be sure to keep an eye on their proximity to the power lines. They may be fine now but at some point they could interfere with the wires. Of course, you want to be sure there are no trees branches touching the power lines. But also pay attention to any branches hanging above the wires. During a storm, those branches could break off and cause damage to the power lines. This could mean a preventable disruption in electricity for you and potentially for your neighbors. They might not be very happy with you about that. It’s better to avoid the issue altogether by calling in a professional tree trimming or removal service to take care of the branches before they become a problem. If you notice that you have a tree with a hollow trunk you should call a professional immediately to come and examine the tree. In reality, a hollow tree can stand for many years. This is because the structural support for a tree is actually around the outer edge rather than in the center. However, that’s not always the case. The average person won’t be able to tell whether the tree is truly a risk or not. In most cases, it’s better to remove the tree anyway to be on the safe side. Remember, a homeowner you could be liable for damages or injuries caused by a hazard on your property that you knew about and didn’t take care of. This would include a hollow tree falling on your neighbor’s house or on someone and causing injury. There are a number of plants that have a symbiotic relationship with certain species of trees. Thus, it’s not uncommon to see plants or fungi growing on tree trunks or branches. However, if you start to notice a new plant or fungus growing on a tree in your yard you may want to get it checked out. Sometimes the presence of these plants indicate that the tree is sick and perhaps even dying. Another thing to watch out for is the presence of insects. There are many insects that live in perfectly healthy trees so simply the fact that they are there doesn’t mean that your tree is bad. It depends on the kind of insect. Some insects may be causing damage to an otherwise healthy tree. Piles of sawdust around the base of the tree is a sure sign that there are insects causing damage. Other types of insects may be feeding off of the decaying flesh of the tree as it is slowly dying. The only way to be sure what’s going on in your case is to have a professional inspect your tree. Depending on the type of insect or plant, you may also want to ask about the other trees in your yard. Some tree diseases are contagious. And sometimes when you remove an insect-infested tree they simply move on to the next one. Also, keep an eye on the trunks of your trees. Do you notice large patches of missing bark? This is another indication that your tree may be suffering some sort of disease. It is not uncommon for trees to shed their bark. In fact, as a tree grows it needs to shed its bark in order to expand. However, a healthy tree will constantly be regrowing new bark to replace the bark it sheds. Thus, if you notice bald patches that could be an indication something is wrong. Insect or animal damage as well as fungal diseases are all potential causes. There are several possible causes for there being holes in your tree trunk. Insects can leave holes in your tree trunk as they eat through the wood and burrow to make homes. Additionally, birds such as sapsuckers and woodpeckers may make holes in your tree trunk as they peck away to get at those insects to eat them. In many cases, these holes may not cause a problem for the tree. Unless, of course, the insect infestation runs very deep. Sometimes the holes the birds make can cause structural problems for the tree if they put a lot of holes in the same spot or in a ring around the tree. If you’re not sure whether the holes are bad enough to warrant a problem it’s best to call a professional. They can inspect the tree and advise you of your options. If the damage is not yet too extensive you may be able to take measures against the pests causing the holes and save your tree. A healthy root system for trees is integral to keeping them standing upright. The only way for a tree to sustain its weight is by having a strong, healthy, deeply grounded root system. Thus, if you notice that the root systems of your trees may be damaged or decaying don’t hesitate to contact a professional. This could be an indication of a serious problem. The last thing you want to have happen is have a tree uproot itself and fall on your house or garage with the next strong wind. Sometimes decayed or damaged root systems happen because the tree is injured or sick. In other cases, you damage them with home improvement work you were having done. Any project that requires digging in your yard, like replacing plumbing or removing tree stumps, carries the risk of damaging the root systems of your trees. Thus, when contracting workers that will be working in your yard near your trees be sure they’ll be taking care of your vegetation. But if you notice that they’ve damaged the roots of one or more of your trees you’ll need to address the situation before it gets worse. The last sign that you need a tree removal service is perhaps the most obvious one. If you have a fallen tree on your property you need someone to take care of it for you. You may think you can take care of it yourself. And if you want to go to the effort you can. Just know you’ll need to have time and the equipment necessary to do it. Also, depending on what caused the tree to fall you may still want to call a professional. Why did the tree fall? If it was damaged by insects or infected with an illness there may be other trees in your yard posing a hazard that you don’t know of yet. It’s a good idea to have all your trees inspected to ensure their safety. If you notice any of these major signs of damage to your trees don’t hesitate to call a professional. If you delay the tree could fall and cause thousands of dollars in damage or even injure someone. If disease or insects are the problems, waiting could also allow these problems to spread and become more of an issue. 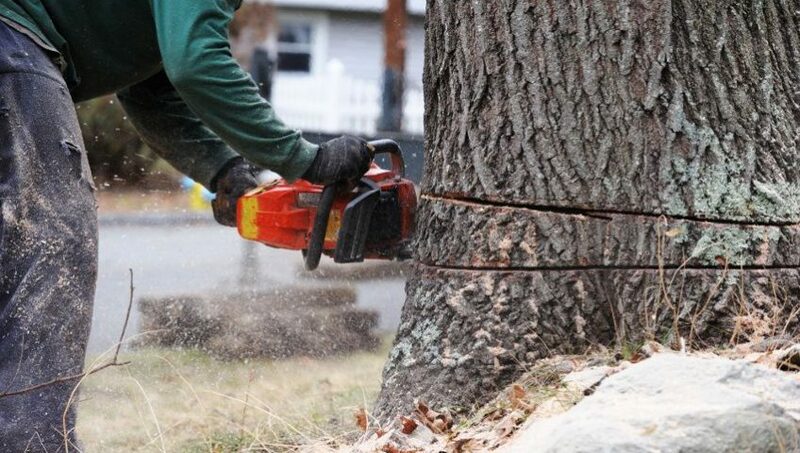 To save time and money, and your other trees, it’s better to seek a tree removal service sooner rather than later. As part of our services, we have a full-service tree removal division. Our courteous professionals are highly trained in safely removing trees. It doesn’t matter how large they are or how close they are to your house. Don’t hesitate to contact us today. You will rest easier knowing that your dangerous tree isn’t going to fall on anyone or anything.